Origin: Oceano Indiano: dalle coste dell'Africa sino a Sumatra. Bottom fish, peaceful and sociable. The breeding is almost identical with respect to that of S. splendidus. Despite being an animal of small size and slow swimming, due to its naturally shy and peculiar ways it feeds, it requires a tank with plenty of hiding places and live rock. 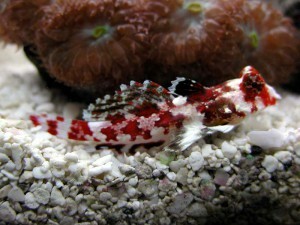 Given its peculiar diet, can not survive feeding only of the food administered by the aquarist but, as for the affine S. spledndidus, must also be able to feed the microfauna in the aquarium, so it should be introduced into a tank well established and stable, run for at least 6 months/1 year. Possibly, the tank should be equipped with an external refugium with a deep sand bed or with additional live rocks, making it possible to have more food available to the animal. It does not tolerate nitrate levels above 15-20 mg/l. Algae eater, his little mouth makes it unsuitable to feed on foods of big size. It must be fed live food, freeze-dried or frozen small size, quality and varied: brine shrimp, Mysis, chopped clams, lobster eggs, frozen plankton and Cyclops are all suitable. You may occasionally get used to feed on micro-granulated food. Since its rapid metabolism and the inability to feed on prey of big size, you must feed it at least 2 times per day. Peaceful and sociable, should be brought up in pairs or, in the case of larger tanks, in small groups of 3-4 individuals, since it can be somewhat territorial, you should only breed a male for each tank, except in very large tanks. Do not harass or harm invertebrates. It should not be kept with voracious, aggressive or fast in swimming animals, which could put him in difficulties with regard to the supply of food or harass him. The acclimation should be done with caution, it is recommended to use the method of "drop by drop", since sudden changes in salinity or temperature may cause loss of appetite or disease. The play took place in the aquarium but it is almost impossible to accomplish successfully. The male has a dorsal fin with the first beam very long. Reproduction involves the release of some hundreds of planktonic eggs in the water column after an intense courtship.